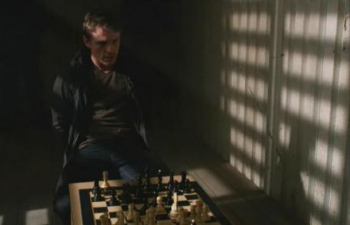 Vince wakes up to a chess set and a sad-looking Marty. Chess himself strides in, saying Vince forced him to fine-tune some plans. He likens Vince's family to the king in his chess game, which is ridiculous, because he would have had a much stronger metaphor referring to Dana as Vince's queen, but whatever. Surprise #1: Chess unmasks. The surprise isn't that he's Peter Fleming, ARK Corp CEO, or that he intends to scare the city so bad they'll beg ARK to privatize the police right away, but that he actually unmasks. This means, obviously, that Vince has to die. Say it ain't so! Fleming's thugs, supervised by Marty, staple the Chess mask onto Vince's head and set him free. Law enforcement jumps on him fast, as now Vince is fleeing outside, in broad daylight, followed by choppers, cops, and television cameras. Of course, the TV is on in the Faraday home, and Dana and Trip are watching. Vince tears the front of the leather mask off without tearing into his head at all, which makes sense, because leather is so simple to tear with one hand, particularly when both sides are attached to your face. Anyway, the news can see his face now, which is what's important, because they can verify his identity. Vince escapes, inadvertently faking his death by escaping underneath an exploding tanker truck. Here comes the crazy: Vince wakes up in a weird, drugged out Moulin Rouge nightmare, seeing contortionists, monkeys, and ladies with tattoos through his blurry haze. He regains full consciousness after being punched in the face by little person Rollo, and promptly has his weight guessed ("187, on the nose") by the scenery-chewing Max Malini. There's a lady eating cotton candy. A man turns on the television with his stilts, on which the newscaster is discussing "Vince Faraday, a.k.a. Chess," at which point there's an ominous organ chord, courtesy of Max. Funny you should say that paragraph reads like a crazy amalgamation of weird and clichÃ©d images; that's exactly what it looked like on the TV. It gets better, as Max informs us that they're "The Carnival of Crime: professional bank robbers." So the bank robbers have a circus schtick, but they love it so much that they spin cotton candy and run about the place on stilts in their off-hours? Okay, sure. Vince offers up a trade: Let him go, he'll give up his ARK keycard, which bypasses all their security codes. So the Carnival gets to robbing, in a peppy little montage involving clown masks and a raccoon. Think the opening sequence of The Dark Knight, but rated G. The agreement between Vince and the Carnival eventually distills itself into: Help us rob Peter Fleming, and we'll help you get your family back. Except your family thinks you're dead. See? They're having a funeral. You're sort of messing it up by very obviously stalking the solemn proceedings from behind that tree, but whatever. It's your funeral. Commercial break. From the beginning of the show to now, 24 minutes have passed.